Eve Hewson is an Irish actress, best known for playing the role of Mary in the 2011 film This Must Be the Place. From 2014–2015, she portrayed Nurse Lucy Elkins on the Cinemax drama series The Knick. She also played Yvonne in the 2013 thriller film Blood Ties. She appeared in the 2013 romantic comedy film Enough Said alongside the late James Gandolfini. 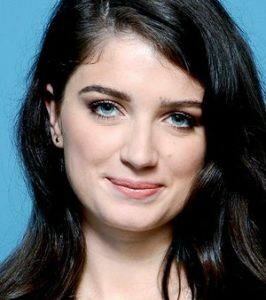 Born Memphis Eve Hewson on July 7, 1991, in Dublin, Republic of Ireland, she is the daughter of U2’s legend Paul Hewson (Bono) and Irish activist Ali Hewson. She has three siblings: older sister Jordan and younger brothers Elijah Bob Hewson and John Abraham Hewson. She was educated at St. Andrew’s College in Dublin and New York University (NYU). She made her acting debut in the 2005 short film Lost and Found, alongside her older sister Jordan. She has been in a long term relationship with actor James Lafferty, whom she met in 2007 while filming The 27 Club. *She was born in Dublin, Republic of Ireland on July 7, 1991. *She received a degree from New York University. Her father turned down an honorary Doctor of Humane Letters degree the same day. *She currently resides in Brooklyn, New York.